Made from original vintage fabrics from the era of the characters they depict by our friend Choppa. All cushions have 100% cotton brand new fabric backings and contain new cushion pads, made from 100% Polypropelene casing with 100% Polyester filling, that conform to all relevant british fire safety standards (B.S.5852 part 2 ignition source 2). All cushion covers have the 'Choppa' logo label in the side seams and branded 'Choppa' care labels (machine washable) inside so you can be sure you will receive an item of top quality. 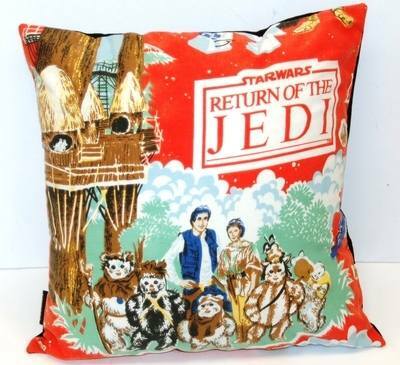 We have a huge range of designs including a large selection of Star Wars, superhero, retro gaming, and 80s TV characters, but if you can't see the design or character you are looking for please email us info@kaotichandbag.com as we may be able to source some fabrics to order.